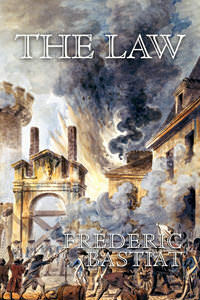 For a few $ more you could get the Bastiat Collection which includes this book. This little book is remarkable in many ways. It is brief, direct, incisive, and timeless. Dividing people into two classes - those who profit from production [i.e. work] and those who profit from legal plunder (that is, who use the law to seize the wealth of others) - Bastiat makes clear the abuses of government when it does anything other than maintain order and protect property rights. Bastiat also points out the Rousseau, the "Leader of the Democrats" favored extensive legal plunder, and that Socialism is a system dependent entirely on legal plunder. The Law is a favorite of economist and columnist Walter Williams, who some may know from the Rush Limbaugh Show (he is regularly a guest host). Williams wrote the introduction to another edition of The Law. This is my favorite book on politics and economics. It should be required reading in all high school civics classes. Although it was written in France in 1850, it applies very well to the situation we have in America in 2010. The broken window analogy is expanded masterfully to all sorts of state sponsored programs. If you love liberty and freedom, you must read this book. If you are a beginner on economic theory and want to learn more, you must read this book. It is an indispensable little book that is short, easy to read, and easy to understand. this book is the best statement of what some refer to as the freedom philosophy that I have ever read. It has turned the light on in many people's political-economy education. After reading Bastiat's first 10 pages you are well equipped to chat with the re-distributionist (aka - Liberals) of our day. There is really no answer to his simple yet powerful approach. I learned that society ie. "The Law" is either unjust or just depending upon its decision to either protect or take private property. End of debate. Leoni's contribution has been unjustly overlooked. The availability of this work helps to rectify this situation. In The Tuttle Twins Learn About The Law, your children will follow Ethan and Emily as they learn about liberty!